In The Crease: Do you remember ... ? When word came today that the Friday's NHL press conference and draft lottery would be televised on U.S. television I was first, shocked, and then memories flooded in. MSG -- Hockey's Back: Starting at 3 p.m. EDT, MSG will show both the press conference and draft lottery. Then, at 9 p.m., MSG will host a roundtable with John Davidson, Sam Rosen, Doc Emrick and Stan Fischler. Comcast SportsNet (Chicago, Mid-Atlantic and Philadelphia) & Altitude Sports Network -- Press conference at 3 p.m. EDT and subsequent draft lottery. ESPNEWS will also show cut-ins of TSN's coverage of the draft lottery. TSN's coverage spans from 2-7 p.m EDT. Doesn't it remind you of the old days, flipping between games? Trying to catch the best intermission interviews, spellbounding saves and last-minute game-winners? Ah, yes. It's only a matter of time. It was no suprise that the players ratified the CBA today in Toronto. The majority of players -- 87 percent -- are sane individuals (CP). They know that while this might not be the best deal, it's not going to get any better right now. And sitting out another year will do nothing for their careers, especially the 40+ crew. Photo courtesy of AP. "The two, appearing at a joint news conference for the first time since the Salt Lake City Olympics in 2002, practically killed each other with kindness Thursday as they came together to announce the ratification of a new collective bargaining agreement by the players. Please. Thank you. I agree. You're quite right. No, you first. I insist. As for the fact the two have been at each other's throats in boardrooms and across bargaining tables for more than a decade? Completely blown out of proportion, they insisted -- a media fairy tale. "I think there's been too much made about a fragmented relationship. It tends, I suppose, to make for interesting reading and telling," Bettman told reporters during a news conference that was broadcast live nationally in hockey-starved Canada. "But Bob and I have always had a professional relationship. On a personal level we've never had a problem dealing with each other. And I don't suspect there'll be any change in that. 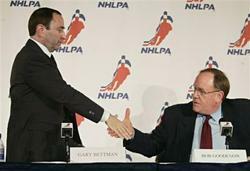 "I have no doubt that labor and management can work together for the benefit of the game and the fans in an unprecedented way," Bettman added. "I agree totally," Goodenow chimed in, and it was a wonder he didn't throw his arm over Bettman's shoulder to make the point." I almost wanted to puke just then. Really, I hate them both equally. Goodenow is the grinch who stole our NHL season and Bettman was the annoying little dog, tagging along and dragging fans through the mud. Not to mention Bettman's tenure has driven the league to the brink of existence. Oh well. Tomorrow, we'll get another goofy grin from Bettman and a deep sigh from Goodenow. They can put on the happy faces all they want. But tomorrow is only the beginning of a rocky road to opening night. Hey, at least it's a start! Are you sure those two aren't photoshopped into that picture?? P.S. Detroit's gonna rock out with their one ball tomorrow. Hey, the way I look at it this will probably be the best draft for us in years.